NEWLY REDEVELOPED Apartment Homes Available NOW! 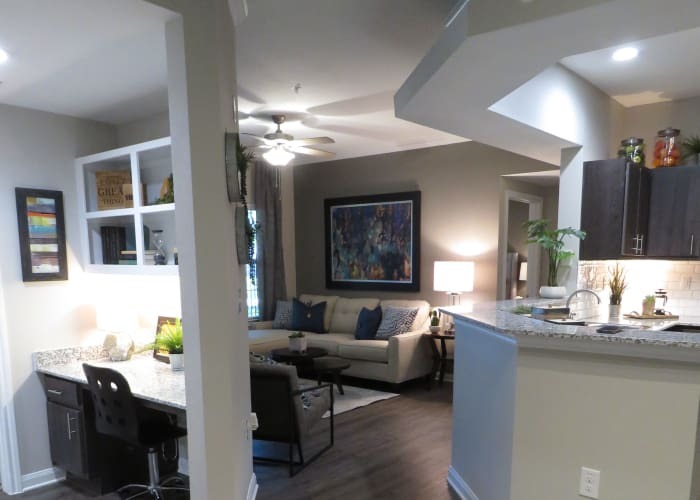 The one, two, and three bedroom apartments for rent at The Abbey at Barker Cypress in West Houston, Texas, come fully equipped with gourmet kitchen and stainless-steel appliances. Granite countertops and wood-style flooring add a flourish of style, while the private patio or balcony gives you a comfortable spot to enjoy the outdoors without leaving home. Each floor plan is also outfitted with conveniences, like air conditioning, ceiling fans, and a dishwasher. The Abbey at Barker Cypress apartment community features a variety of outdoor and indoor community areas, perfect for those who like to entertain. The theater room and clubhouse offer great spaces to host guests on the weekends and the playground, basketball courts, and putting green provide the ideal workday retreat for adults and children alike. With garage parking and close access to Interstate 10 and Highway 6, we make it simple for you to live comfortably. Make your house a home and bring your cat or dog with you to The Abbey at Barker Cypress. We welcome up to two pets per apartment with some breed restrictions. For more details on our pet policy, please contact the leasing office. Ready to view your new home in person? Give us a call; we’ll be happy to help you schedule a tour of our West Houston apartments.